If not properly maintained at regular intervals, biological growth, stubborn environmental stains, food stains, grease, oil, dirt, and grime all contribute towards an overall decline in the appearance of the architectural components of commercial structures. Preventing a substantial decline in the appearance of commercial structures is an important aspect of successful management of these assets. Ensuring that a structure remains in a condition that is both safe and inviting to visitors and occupants is a contributing factor to its overall value. 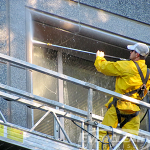 Everclear Enterprises, Inc. is experienced in safely and responsibly maintaining all types of vertical and horizontal surfaces commonly found on building facades, pedestrian plazas, and parking structures. We routinely assist our clients in making sure their assets always look their best.